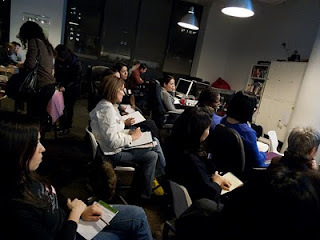 Last Wednesday, we held our inaugural Cupcake Business class. It sold out quickly, so we are doing another one in March. (More on that later.) Keavy Landreth of Kumquat Cupcakery and Michelle Dobrawsky were our speakers. Read Keavy's recap here. I lead the discussion, while both Rachel and Melissa offered great advice and insight. Our class had people come all the way from Baltimore, Boston, New Jersey, Philadelphia and even Staten Island. 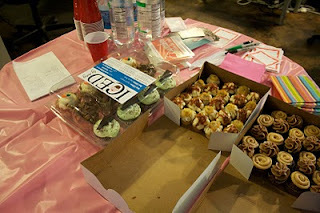 Some brought cupcakes like Betsy from Iced by Betsy Gibbons and Victoria Donnelly from Cakeology. Michelle Dobrawsky is an attorney, and she spoke about trademarks,trade dress and business structure. The class covered several topics, and here is a brief summary of the outline. Note that this is not an exhaustive list of everything discussed, but an overview for those who were not there. 1. Do A Gut Check-Make sure this is what you want to do. 2. Do Your Homework-Research your market, start-up costs-both offline and online. 3. Getting the Dough-Look for options on how to finance your business. Loans? Equity? 4. Create A Business Plan-Have your vision well-documented and updated regularly. 5. Choose A Good Name that is not like everyone else. 6. Set up your corporate structure and accounting system. 7. Promote-both offline and online using social media, word of mouth, advertising. 8. Go Local-Get involved with your local small business community. 9. Delegate- Find the right employees. 10.Be consistently great-Creativity, quality and customer service. Our next Cupcake Business Class will be March 3rd. The meetup RSVP will be up on February 1st, but I am telling you now in case you need to make travel arrangements. It will be an 2 1/2 hour class ending around 9PM. 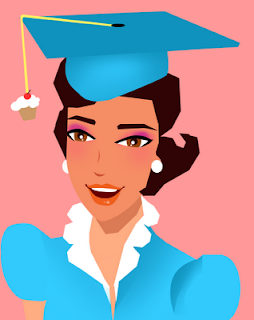 Thanks to Miah for creating a cute little illustration for the Cupcake Business Class. I really want to come to this. I don't think I'll be able to make it up from Florida, though. Are there any classes like this in the south at all?